Lawmakers in Concord are again trying to craft a response to last summer’s decision by the U.S. Supreme Court that cleared the way for other states to require New Hampshire businesses to collect and remit a sales tax when they sell a good to a customer in that state. The 5-4 Wayfair ruling overturned nearly 50 years of precedent, effectively ending the requirement that a company have a “physical presence” in a state before it could be expected to collect a sales tax there. The decision was predicted to have dire consequences for New Hampshire businesses since most have no experience collecting a sales tax. In response to Wayfair, Gov. Chris Sununu called for a special legislative session to craft a law that would attempt to protect businesses. After a week of hearings and drafts, the Senate unanimously passed a bill that backers said created high hurdles for other states attempting collect a sales tax. The bill failed in the N.H. House, though, where lawmakers cited a range of concerns about its effectiveness and approach. Lawmakers this session are trying again, and have at least three different bills before them, each taking a different approach to the issue. The House Ways and Means Committee heard preliminary testimony on two bills on Tuesday, including a measure backed by Rep. Michael Harrington of Strafford that simply restates a section of the N.H. Constitution that he believes expressly prohibits tax collection efforts by other states. “I’m bringing it back to the basic part from the New Hampshire Constitution, which I’m saying we’ve all sworn to uphold, which says they can’t do it to us. And I think that is worth defending,” said Harrington. While some lawmakers appear to support that defiant approach, a group of Senators are expected to release a bill shortly that would build upon last summer’s legislation that attempts to discourage other states. It’s possible that either approach, if passed, could result in a court challenge. While dozens of other states have passed laws in recent years clearing the way for the enforcement of cross-border sales tax collection, the N.H. Attorney General’s office told lawmakers on Tuesday that it has received notification of only a single tax notification received by a New Hampshire business since Wayfair: that letter about potential tax liabilities came from Indiana. 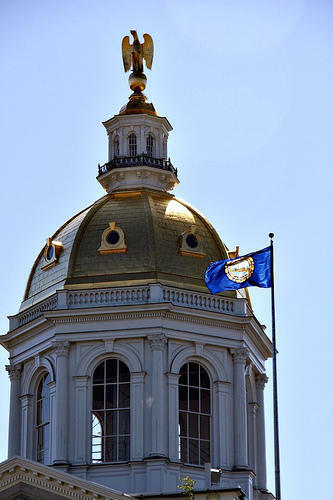 Separately in Washington, New Hampshire’s federal delegation is backing a bill that would shield businesses in the five states with no broad based sales tax from the effects of the Wayfair decision, though that measure faces long odds.